My spiritual journey has brought me into the presence of many great men and women. Some I met only through their writings. Such a one is Thich Nhat Hanh. My journey has also been greatly enriched by coming in contact with other traditions. My initial exposure to Buddhism came through Alan Watts’ The Book as well as Salvador Minuchin’s metaphor of family therapist as samurai warrior. I have read much of Buddhism since then, especially Zen. But none have touched my mind and heart in the way that Thich Nhat Hanh has. 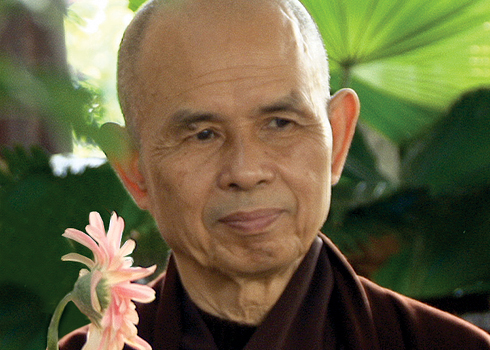 Nhat Hanh is a Vietnamese Buddhist monk who has devoted his life to living peace and to helping others live in peace. His own journey has caused him to be expelled from his homeland, to serve at the Paris peace talks and to be nominated for the Noble Peace prize by Martin Luther King. In the name of peace, he has encouraged and written about dialogue among different faith traditions. As such, two of his books have had a deep effect on me — Living Buddha, Living Christ and Going Home: Jesus and Buddha as Brothers. Both works explore the common ground of both traditions. Nhat Hanh’s thoughts help me embrace other traditions when he writes: “I do not see any reason to spend one’s whole life tasting just one kind of fruit. We human beings can be nourished by the best values of many traditions.” Yet he also challenges me to embrace my own Catholicism when he says: “Learning to touch deeply the jewels of our own tradition will allow us to understand and appreciate the values of other traditions.” Thus he challenges me to be open to what I can learn from other walks while at the same time to embrace the jewels of my Catholicism. Buddhism has helped me in numerous ways. The concept of attachment and detachment helps to face my anxieties and to see how my control issues bring on my own suffering. The central place of mindfulness challenges me daily to pay attention and to listen not just in the therapy room but on my ride to and from work, at the dinner I share with my wife, even as I watch my Boston Redsox. Buddhism in many ways gives me a whole other understanding of the central AA concept “Let go and let God.” Finally, Buddhism is one of the few traditions that shares commong ground with Jungian psychology. Even today as I was thinking of his impact on me, I read a small book by Nhat Hanh titled Be Still and Know. First I read “In Buddhism, our source of energy is faith in daily practice. Faith in an idea (his emphasis) is risky.” Thus what matters if I claim to be Christian is how I practice that every day, not so much the underlying theology or what I say I believe. The irony is not lost. By embracing the writings of a Vietnamese Buddhist, I may actually become clearer on what it means to be a Christian. This entry was posted in psychology, spirituality and tagged Buddhism, Jungian psychology, mindfulness, Thich Nhat Hanh, Zen. Bookmark the permalink.